Lister moved to ANU to join the Research School of Earth Sciences at ANU in 2003. His efforts have been focussed on: 1) structural geology on the planet scale; 2) diffusion theory for argon geochronology in order to allow precise dating of the effects caused by rock deformation, and in order that field observations can be brought to constrain the timing of the large-scale movement picture; 3) ensuring practical application of the basic principles of structural geology and tectonics that emerge from such research to engage in cutting-edge research in mineral exploration science. His hobby is software development, including programs such as eArgon, eQuakes, and Pplates, some of which now enjoy wide usage throughout the community. My interest is in all aspects of structural geology and tectonics. I am part of the Satellites, Seismometers and Mass Spectrometers initiative by which we link the occurrence of natural hazards to present movements on structures formed in deeper time. I am involved in projects currently in progress that include the Closing Tethys project, the 4D porphyry project, and an AISRF project comparing the timing of tectonic events in the Himalaya. In the 4D porphyry project we try to understand the geodynamic factors that lead to the localisation of important classes of copper and gold deposits, both in time, as well as determining where they are to be found. SE Asia is being used as a tectonically very active laboratory in order to make the link between known deposits and geodynamics as inferred from modern-day processes. In the AISRF project we attempt to demonstrate the synchroneity of tectonic processes from one side of the Himalaya to the other. My main contribution during 2014 in terms of research infrastructure comes from the development of software: Pplates, 4D tectonic reconstruction including of the subducted lithosphere; ii) eQuakes, structural analysis of seismotectonic data; iii) eArgon, analysis of data from step-heating experiments for 40Ar/39Ar geochronology, and inversion; and iv) MacArgon, for forward modelling. The image above shows seismotectonic data from oceanic spreading centres in comparison with that from adjacent oceanic transforms. This proves that the P- and T-axes of the centroid moment tensor are not parallel to the regional stress axes. In addition is shown that the oceanic transforms must be localised by deep ductile faults. Lister G.S, Tkalčić, H., McClusky, S. and Forster, M.A. 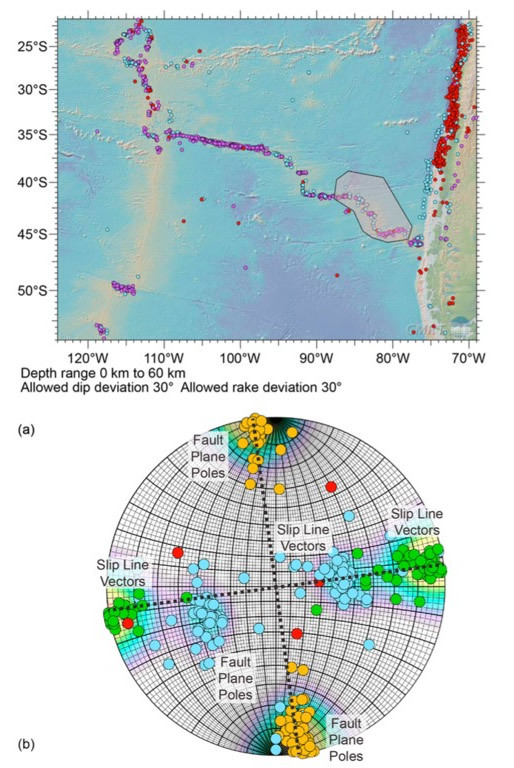 (2014) Skewed orientation groups in scatter plots of earthquake fault plane solutions: implications for extensional geometry at oceanic spreading centres. Journal of Geophysical Research. Viete, D.H., Oliver, G.J.H., Fraser, G.L., Forster, M.A., Lister, G.S. (2013) Timing and heat sources for the Barrovian metamorphism, Scotland. Lithos 177, 148-163. White, L.T., Gibson, G.M., Lister, G.S. (2013) A reassessment of paleogeographic reconstructions of eastern Gondwana: Bringing geology back into the equation. Gondwana Research 24, 984-998. Lister, G.S., White, L.T., Hart, S. and Forster, M.A. (2012) Ripping and tearing the rolling-back new Hebrides slab. Australian Journal of Earth Sciences 59 (6), 899-911. White, L.T., Ahmad, T., Lister, G.S., Ireland, T.R., Forster, M.A. (2012) Is the switch from I-to S-type magmatism in the Himalayan Orogen indicative of the collision of India and Eurasia? Journal of Geodynamics 56, 7-17. Viete, D.R., Hermann, J., Lister, G.S. and Stenhouse, I.R. (2011) The nature and origin of the Barrovian metamorphism, Scotland: diffusion length-scales in garnet and inferred thermal time-scales. Journal of the Geological Society, London 168, 115-131. Viete, D.R., Forster, M. and Lister, G.S. (2011) The nature and origin of the Barrovian metamorphism, Scotland: 40Ar/39Ar apparent age patterns and the duration of metamorphism in the biotite zone. Journal of the Geological Society, London 168, 133-146. Forster, M. and Lister, G. (2010) Argon enters the retentive zone: reassessment of diffusion parameters for K-feldspar in the South Cyclades Shear Zone, Ios, Greece. In: (eds.) Iole Spalla and Guido Gosso “Advances in interpretation of geological processes: refinement of multi-scale data and integration in numerical modelling”. Geological Society London, Special Publications 332, 17-34. Viete, D.R., Richards, S.W., Lister, G.S., Oliver, G.J.H. and Banks, G.J. (2010) Lithospheric-scale extension during Grampian orogenesis in Scotland. In: (eds.) R.D. Law, R.W.H. Butler, R.E. Holdsworth, M. Krabbendam and R.A. Strachan “Continental Tectonics and Mountain Building: The Legacy of Peach and Horne” Geological Society of London, Special Publications 335, 121-160.